*I received this ARC through Goodreads and it sounds like something I'll really enjoy. I can't wait to review it. Goodreads says, "Riley Blackthorne just needs a chance to prove herself – and that’s exactly what the demons are counting on…Seventeen-year-old Riley, the only daughter of legendary Demon Trapper, Paul Blackthorne, has always dreamed of following in her father's footsteps. The good news is, with human society seriously disrupted by economic upheaval and Lucifer increasing the number of demons in all major cities, Atlanta’s local Trappers’ Guild needs all the help they can get – even from a girl. When she’s not keeping up with her homework or trying to manage her growing crush on fellow apprentice, Simon, Riley’s out saving distressed citizens from foul-mouthed little devils – Grade One Hellspawn only, of course, per the strict rules of the Guild. Life’s about as normal as can be for the average demon-trapping teen. But then a Grade Five Geo-Fiend crashes Riley’s routine assignment at a library, jeopardizing her life and her chosen livelihood. And, as if that wasn’t bad enough, sudden tragedy strikes the Trappers’ Guild, spinning Riley down a more dangerous path than she ever could have imagined. As her whole world crashes down around her, who can Riley trust with her heart – and her life?" *I won this signed book over at Confessions of a Bookaholic. It also included a fun water bottle, too. This book looks like the perfect beach read! Thanks, Jessica! Goodreads says, "Claire is a #hopelessromantic. Lottie is determined to set up her BFF with Mr. Perfect. Will wants his #secretcrush to finally notice him. Bennett is a man with a plan. Claire can’t believe it when her dream guy starts following her on Twitter. She never thought he noticed her, and suddenly he seems to understand her better than almost anyone. But the Twitterverse can be a confusing place, especially when friends act differently online than they do in person. Things get even more complicated when Claire realizes she’s falling for someone else, the last person she ever would have expected….Told in an innovative format combining tweets, emails, and blogs, Tweet Heart is a contemporary romantic comedy that will set your heart atwitter." Thankfully, I didn't buy any books this week, but I'm sure I will next week, because there are a lot of great books coming out! What did you get in your mailbox? Have you read any of these books? Let me know what you think. This meme is hosted by The Story Siren. Great books! Demon Trapper's Daughter sounds great! i hadn't heard of demon trapper's daughter, it looks really interesting!! i'll have to keep an eye out for it! Oh color me jealous, I can't wait for The Demon Trapper's Daughter, it sounds so good! I'll be looking for your review of that one for sure, I need something to tide me over until release day! Congrats on the wins! The Demon Trapper's Daughter sounds really good. Can't wait to see what you think. Tweet Heart sounds like a fun book Enjoy! Nice win! I like the looks of Demon Trapper's Daughter, will have to look it up. Ohhh Demon Trapper's daughter is one I've had my eye on. AWESOME! Enjoy your books! I like the sound of Demon Trapper's Daughter, I hope it's good! Thanks for checking out my books, everyone! Have a great week. 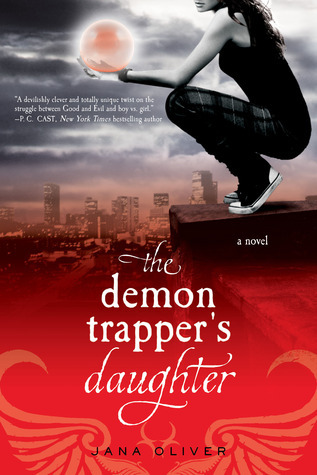 Haven't heard of the Demon Trapper's Daughter, but it sounds interesting. I'll have to check it out. Ooh...first book sounds rather interesting..and the second, certainly sounds like a fun potentially sweet read...can't wait to see your reviews. Happy reading!